When it comes to selecting concrete picnic tables, these are the finest heavy-duty weather resistant picnic tables around. Perfect for your picnic or dining area, This traditional precast concrete picnic table will exceed all of your expectations. The benefits of precast concrete include superior weather resistance, heavy-duty protection from theft and resistance to vandalism, all with a smooth finish for placement in any mid to upscale environment. These traditional concrete picnic tables will create an inviting dining environment or picnic area. 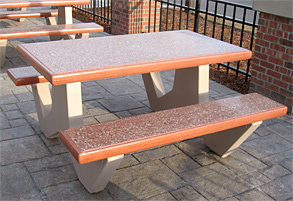 These traditional concrete picnic tables are virtually maintenance-free and vandal-resistant. The simple design and the durability of precast concrete make this traditional concrete picnic table an excellent choice for outdoor weather resistant dining.